Built to look and function like natural teeth, dentures are the most frequently chosen option for patients who have lost multiple teeth. At Broseley Dental Practice, we ensure our denture-wearing patients are happy and comfortable with their appliance and will always support them to look after the denture and their remaining natural teeth. 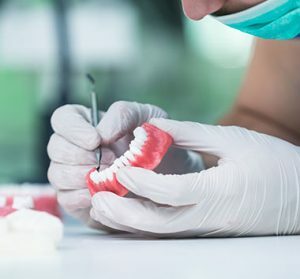 We offer partial dentures for patients who have lost multiple teeth but still have some remaining natural teeth, or full dentures for patients who have lost all the upper or lower teeth. Dentures are made from a combination of materials such as strong acrylic, metal and resin. They are fitted to sit on top of the gums and are helped to stay in place with denture adhesive. We also offer patients Implant Retained Dentures, please click here for more information. Our dentist will take impressions of your teeth as well as dental x-rays so that our laboratory can create a comfortable and functioning appliance specifically for you. Building you the right appliance to meet all your aesthetic and dental needs may take a few consultations, but we want to ensure that you are completely happy with its fitting and appearance.